Sun., Jan. 21, 2018, 10:32 p.m.
Kyle Guy scored 17 points, and No. 2 Virginia beat Wake Forest 59-49 on Sunday night in Winston-Salem, North Carolina, for its 10th straight win. De’Andre Hunter added 16 points to help the first-place Cavaliers (18-1, 7-0 Atlantic Coast Conference) extend their longest winning streak since 2015-16 and open league play with seven victories for the second time in four years. Virginia shot nearly 46 percent in the second half while holding Wake Forest to 30 percent shooting after halftime. 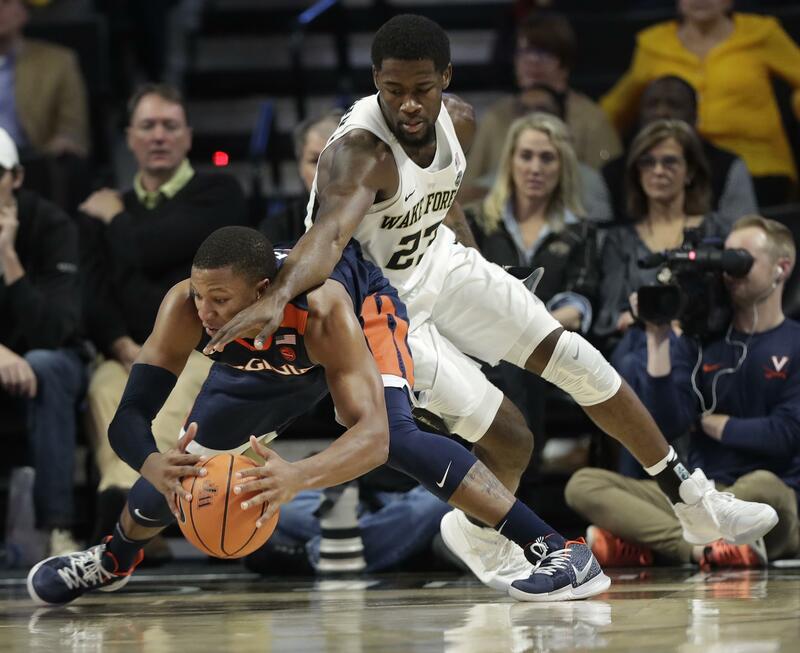 Bryant Crawford scored 11 points, and Mitchell Wilbekin and Brandon Childress added 10 apiece for the Demon Deacons (8-11, 1-6), who kept it close against a highly-ranked Virginia team for the second time in three years but still managed to lose their fifth straight. Devon Hall added 12 points to help the Cavaliers win a tight one in which there were nine lead changes and five ties. (23) Michigan 62, Rutgers 47: Moe Wagner scored 16 points and Duncan Robinson added 12 to lift the Wolverines (17-5, 6-3 Big Ten) over the Scarlet Knights (12-9, 2-6) in Ann Arbor, Michigan. The Wolverines rebounded from a 20-point loss at Nebraska on Thursday, taking the lead for good with a 13-0 run in the first half. Both teams shot well under 50 percent from the field, but this Michigan team is more capable of winning with defense than in the past. Corey Sanders scored 12 points for Rutgers, and Deshawn Freeman added 11 points and 11 rebounds. Freeman also had the only assist of the game for Rutgers, which finished with 13 turnovers. (25) Miami 86, North Carolina State 81: Bruce Brown Jr. scored 19 points and the Hurricanes (14-4, 3-3 ACC) shot 58 percent from the field to beat the Wolfpack (13-7, 3-4) in Raleigh, North Carolina. Anthony Lawrence II and Ebuka Izundu each had 15 points for the Hurricanes. Miami led the entire second half but struggled to put the Wolfpack away in a game that came down to the final seconds. Miami came into Raleigh as one the ACC’s worst 3-point shooting teams, but made 10 of 19 tries from behind the arc for its best output in a league game. Omer Yurtseven had 28 points for the Wolfpack, who shot 63 percent after halftime and 54 percent for the game. Published: Jan. 21, 2018, 10:32 p.m.